Shrinking Space is delighted to be curating a new summer arts programme taking place at Wakehurst, Kew Gardens this summer! For more details and to apply visit our Opportunities page. We have always been fascinated by doomsday scenarios—from disease outbreaks to asteroid strikes, the healthy consideration of the end of the world as we know it has been the inspiration for everything from scientific papers to films. We are particularly drawn to asking who will be the unlikely hero in such an event; perhaps Will Smith or (more likely) scientists in a lab, or an engineer working on an innovative new technology. The real Bulletin of the Atomic Scientists’ Doomsday Clock currently sits at two and a half minutes to midnight, due to our geopolitical situation, climate change and emerging technologies. If the clock strikes midnight darkness will descend, meaning humanity is on the brink of annihilation. The Doomsday Clock was originally designed to highlight how humanity is faring on planet Earth, specifically in relation to a nuclear threat, and over the decades since its inception other existential issues have been added to the doomsday scenarios, including climate change. A panel of experts meet annually to discuss their take on our plight, and push or pull the time closer towards or away from midnight. The ‘safest’ we have ever been was shortly after the fall of the Berlin Wall, which took the clock hand to 23.45. In Manchester, 70 years ago this year, the first programmable computer, nicknamed ‘Baby’, executed its first digital command. At the same time, the question of artificial intelligence was being mooted in conversations about ‘intelligent machines’ between Alan Turing and Grey Walter—and so began the quest to create AI. In the early 21st century, our fascination with the possibility of artificial intelligence, and its ubiquity across all areas of our lives, has led to a proliferation in research into its realisation. Alongside this increase in the inevitable cross-society utilisation of AI, has grown a collection of doomsday warnings from prominent global characters, particularly Stephen Hawking, Elon Musk and Nick Bostrom, as to where all of this will lead. Project Doomsday – The Intelligent Machine Chapter! We delighted to present Project Doomsday – The Intelligent Machine Chapter at The Museum of Science and Industry in Manchester on February 8! Project Doomsday is a fun-filled interactive show where the audience react in real time to an intelligence briefing by expert scientists and performers. The Bulletin of the Atomic Scientists Doomsday Clock has struck midnight, and audiences have 60 minutes to make do-or-die decisions and avert global catastrophe! Directors of Project Doomsday are comedy duo Robin and Partridge. The show will also featuring computer science and cybersecurity expert Miranda Mowbray and more scientists to be announced. Tickets for this event include entrance to our Robots exhibition. The exhibition will be open from 18.00 and Project Doomsday will begin at 19.30. 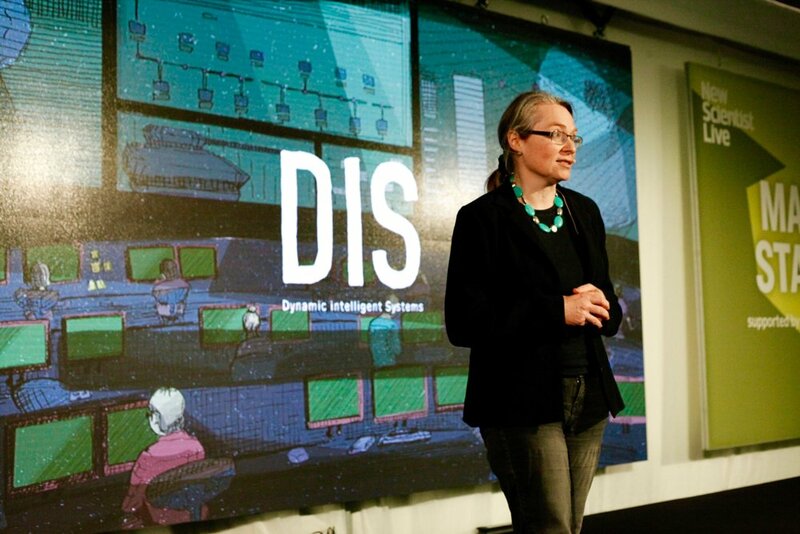 Project Doomsday – The Intelligent Machine Chapter is a Shrinking Space production, premiered at New Scientist Live in 2016. For more information and to book tickets please visit The Museum of Science and Industry website. The theme of blood is interpreted by several artists in powerful ways that resonate with world politics and personal stories. Visitors are encouraged to take white blood cell mini sculptures to signify the dropping white blood cell count in cancer patients, a man explores his heritage by creating a model of his father’s house from his own skin and the idea of the human body as a machine is examined using a mechanical circulatory system that uses pig’s blood. It’s thoughtful and blood brilliant. BLOOD: Life Uncut, an exhibition and event series that demonstrates the captivating power of blood to expose, shock and bring people together. The season highlights the scientific and symbolic nature of blood, exploring personal and provocative stories of this vital, life-affirming fluid that connects us all. The exhibition opens at Copeland Gallery, Peckham next Thursday 12th - join us! 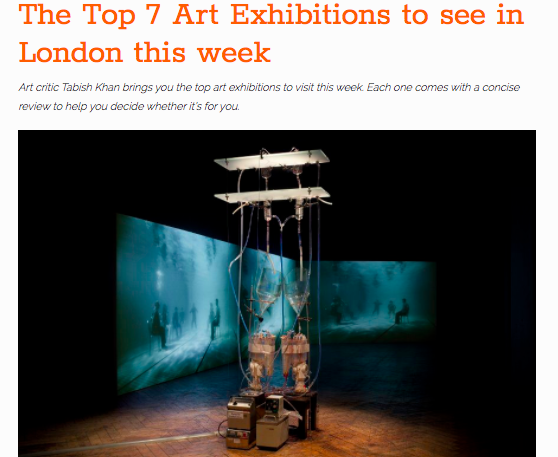 Full exhibition overview can be found here! Thanks to Viewpoint Magazine for featuring Space to Breathe in The Morality Issue, Summer 2017. In January 2017 over 3,000 people participated in #SpacetoBreathe, a weekend of creative action in response to London's air pollution crisis. The artworks, debates and workshops presented over the course of the weekend offered solutions as to how we, as individuals can take practical action to make our cities less congested, cleaner and more energy efficient. Huge thanks to all the artists, partners, supporters and audiences! Space to Breathe was commissioned and produced by Cape Farewell and Shrinking Space, in partnership with King’s College London’s Environmental Research Group. 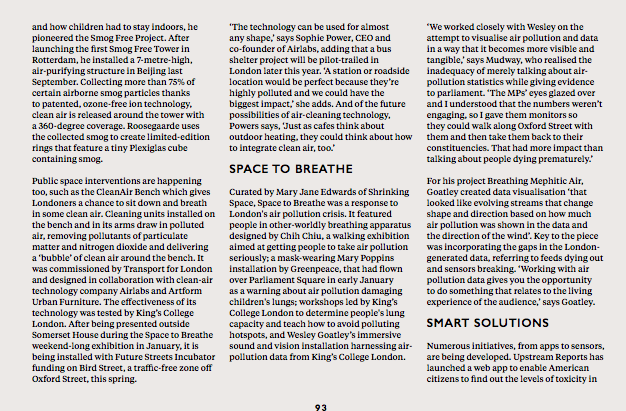 Space to Breathe featured in the Observer, read the full article here!